The chalet we stayed in Courchevel was called Sabot de Venus and was located down a very steep hill. The hill was the kind of hill that could be deadly in slippy conditions - unfortunate given that we were halfway up a snowy mountain... Luckily there wasn't really any issue given that it was so warm. Apart from that, I liked the chalet. We had two chalet girls and one chalet boy. The latter was quite excited to find out I'd taken my DS and Pokemon with me. We swapped a few of the little critters and I filled up some of the (many) holes in my Pokedex. He also cooked us lots of nice dinners which were just about sufficient to soak up some of the free chalet wine. They've developed a very sophisticated mechanism to stop guests fetching their own wine from the kitchen (it's supposed to be only used by staff for H&S reasons). What they do is put the winebox on top of the fridge. This stops short guests getting to it. They then put an open box of eggs on top of the wine box. This means that when a taller person such as myself attempts to access the wine, if the box is tipped a little then all the eggs slide off and onto the floor (or the wine-seeker). And this is clearly not a good thing to happen. Needless to say, on the third night or so, the hosts had gone to bed (or possibly to the pub) and we wanted some more wine. They had actually said we could help ourselves to more wine if we needed, they just neglected to mention the egg-trap. 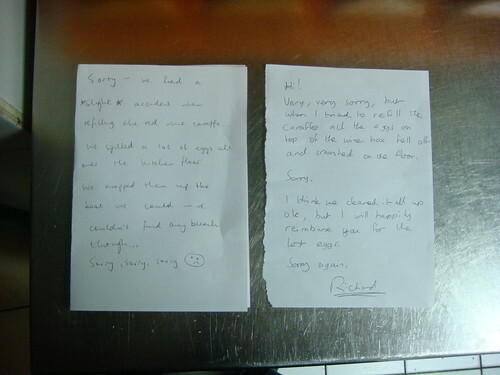 End result was I felt very, very stupid and wrote a note of apology. Unbeknownst to me, my girlfriend had also gone off to write a note in the other room (I think she thought I was too drunk to manage it!). So we left both notes.